Sunday August 31st 1890 We had some extra work to do but got done in time to got to church. We were at the Methodist. We went down to Hatties but they had not come from the valley yet. I wrote to Lee and went out to Marys in the afternoon. I read and wrote in the evening. Monday September 1st 1890 Mother and I took an early start to the valley and were home by eleven oclock. Uncle Jacob was here for dinner and stayed part of the afternoon. I had Lawrence fix the fence about the garden and clean up the yard some. I was out there at work and picked cucumbers and tomatoes. Mother was at Niphers for a call. We found Grand Mother no better. Tuesday September 2nd 1890 We were busy about home all forenoon. I fixed some chair cushions. As soon as we got our dinner over Mother and I went up north of town for grapes. I got a dispatch from George Corwine that they would be here tonight. Mother went over to Hatties and they met them at the depot. I had another spell with my stomach tonight. Will writes he does not know when he will be home. Maggie is very low. 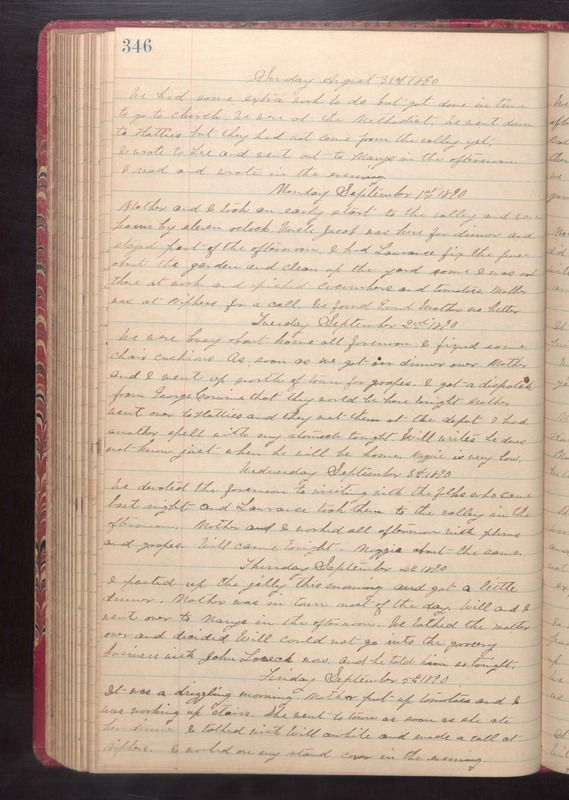 Wednesday September 3rd 1890 We devoted the forenoon to visiting with the folks who came last night and Lawrence took them to the valley in the afternoon. Mother and I worked all afternoon with plums and grapes. Will came tonight. Maggie about the same. Thursday September 4th 1890 I [pasted?] up the jelly this morning and got a little dinner. Mother was in town most of the day. Will and I went over to Marys in the afternoon. We talked the matter over and decided Will could not go into the grocery business with John Loueck now. and he told him so tonight. Friday September 5th 1890 It was a drizzling morning. Mother put up tomatoes and I was working up stairs. She went to town as soon as she ate her dinner. I talked with Will awhile and made a call at Niphers. I worked on my stand cover in the evening.